Made from your favourite recipe with a hint of mustard, Best Foods Coleslaw Dressing is a sweet and tangy pourable dressing. 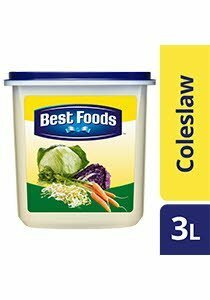 Ideal for coleslaw, potato, rice, bean and pasta salads. It is also a replacement to mayonnaise for sandwich fillings. Soybean Oil, Sugar, Eggs, Salt, Acetic Acid, Mustard, Xanthan Gum, Preservative (E211), Flavouring (Contains Peanut, Mustard), Calcium Disodium EDTA.